So says Isaac Asimov, the master magician of science fact and fiction, in his Introduction to this far-ranging, fascinating, factual work. First, in his clear, instructive manner, he examines the riddles of our solar system: its remarkable symmetry and its puzzling regularities. Then he returns to earth to explore the intriguing vagaries of certain metals; the clues behind the disappearance of the dinosaurs; the causes and effects of the dark region of chromosome abberations; and even to probe the future role of women in our society. But whatever the subject at hand, Isaac Asimov displays the keen wit of the fiction writer and the critical perception of the professional scientist which ahve made him the most acclaimed and widely read author in the field of popular science. For all their diversity, each emerges as a brilliant jewel. While I would be hard-pressed, alack, to place this at the top of the heap of F&SF essay collections, it would definitely not be towards the bottom, either. It has some very memorable essays—and, alas, a couple which have become all too dated over the last forty years. The latter first. “Little Found Satellite” includes a very nice discussion of Saturn’s rings and planetary system, in order to explain how it was that Saturn’s tenth satellite, Janus, wasn’t discovered until 1967. Alas, but Janus as described in 1967 turned out to be only half the picture: it shares its orbit with Epimetheus, as was finally settled by the Voyager probes. 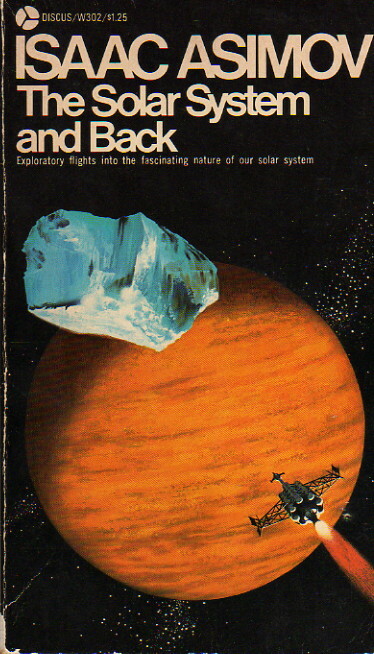 As for the others, “View from Amalthea” would make an excellent brochure for a travel agency selling trips to Jupiter’s satellites, and has the hilarious story of what Asimov did during the premier of 2001, to boot. “The Incredible Shrinking People” is a solid discussion of miniaturization and why Fantastic Voyage wouldn’t work. And “Uncertain, Coy, and Hard to Please” is a very solid discussion of the differences between men and women, and what they mean (or ought to mean). These are just the highlights. So this is a good, solid F&SF essay collection—well deserving its honored place on the shelves of the true fan of the Good Doctor.